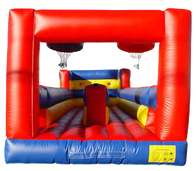 Inflatable Games will add endless excitement without having to enter the inflatables! These are perfect for school and corporate events to add extra fun and make your event STAND OUT! 5 in 1 Sports Combo- Soccer, Football, Basketball, Baseball, and Velcro darts! See the Bungee Run Video!